Is the Amalfi Coast the Most Beautiful Place in Italy? It’s a place like no other on earth, some say…an incredibly beautiful land of mountain and sea, where pastel buildings tumble down the hillsides, and little beaches rim a stunning aquamarine sea. It may be the perfect place to while away every afternoon. It’s a stunningly beautiful place, as magical as it is majestic. For many, it’s the most beautiful place in Italy. UNESCO concurred in 1997 when it crowned it as World Heritage Site, citing the beauty of its classic Mediterranean landscape. There’s little wonder it remains a favorite among travelers, and a Shangri-La for honeymooners. Come to the Amalfi once and you’ll find the urge to return almost irresistible, especially if you’ve only spent a day or two in the region. Tucked away on a 25-mile (40km) stretch of the Sorrento Peninsula south of Naples, a region where pastel-colored villages tumble down to a crystal-clear aquamarine sea, and small hamlets high up in the mountains are linked by old mule trails. Beautiful gardens and seascapes greet you at every turn. The area was first settled by Greeks in 600 BC, who were followed by the Romans in the fourth century. In medieval times the Maritime Republic of Amalfi ruled the seas and coast of the region, dominating Mediterranean trade for a century. The Amalfi coast first became popular in the late 19th-century when the narrow two-lane “divina coastiera” – the Amalfi Drive, still the main road in and out of the region ­– was built. Its more modern transformation began during the 1960s when the Jet Set discovered its pleasures, and its popularity hasn’t abated since. 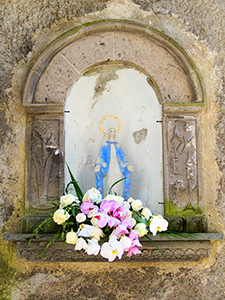 Amalfi has three main towns: Positano, Amalfi, and Ravello. Each is majestically situated, and each is a little masterpiece in its own right. Scattered just a few miles apart and easily accessible, they’re all a bouillabaisse of shops, little cafés and ristorantes, all perfect places for whiling away a few hours. In fact, one of the most pleasurable things to do on the Amalfi Coast is just to while away an afternoon, perhaps over a glass of wine or a limoncello, the region’s famous lemon liqueur. You only need to stroll about any piazza central in these seaside towns to see how it has been elevated to an art form. 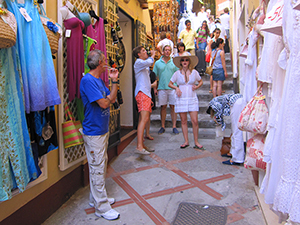 Positano is the glitziest and best known of the three towns, due no doubt to its superb setting. As you approach, it appears almost as if it had been plucked off an old travel poster, a postcard-picture perfect town with all its little pastel buildings tumbling down a steep hillside almost into the sea. Up the highway is the beautiful, historic medieval seaside city of Amalfi, which during the 9th-12th centuries rivaled Venice and Genoa as a great maritime power. 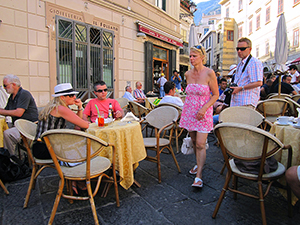 For whiling here stop for a coffee, drink or snack in one of the little cafés near the Duomo di Sant’Andrea, best known for its 11th century Byzantine bronze doors. 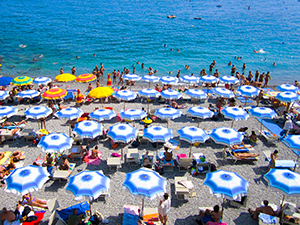 You’ll find a multitude of other cafés and bars down near Amalfi’s popular beach. 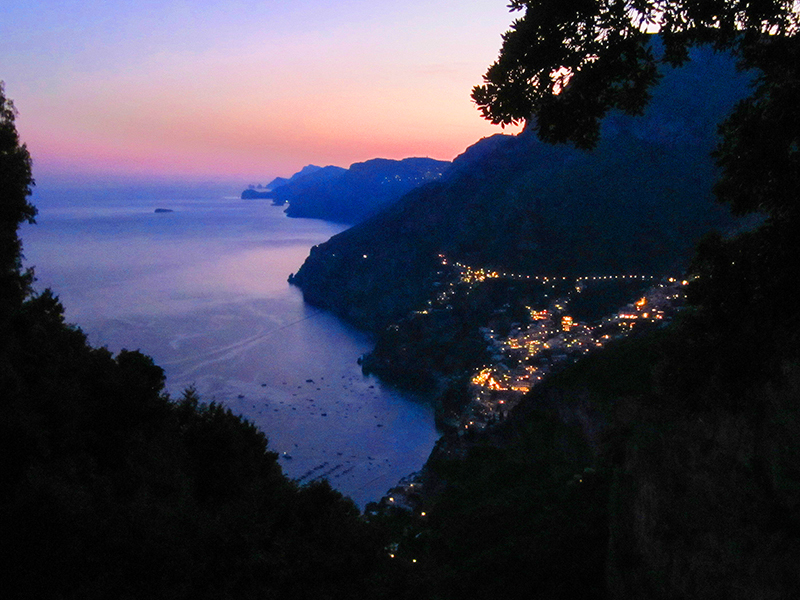 Unlike seaside Positano and Amalfi, Ravello is about 800 feet above the above the Tyrrhenian Sea on a cliff top, reached via 6 miles of serpentine road by either car or public bus (catch the latter in Amalfi). 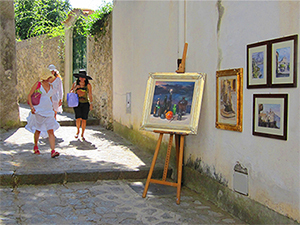 Ravello is the most sophisticated of the bunch, renown for its connection to Richard Wagner since it was where he composed part of his opera Parsifal. The Ravello Music Festival, Italy’s biggest musical event, launches it’s 30th anniversary this year with the first performance on April 3rd and continues to October 12th, with most of the popular performances in the summer months. Wagner stayed at the Villa Rufolo, where some performances take place. 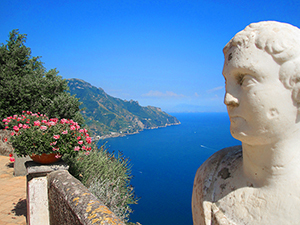 Another villa you should visit in Ravello is the beautiful Villa Cimbrone, only a 10-minute walk from the Piazza Duomo, Walk through it’s beautiful gardens out to its dazzling terrace that’s lined with classical-style busts and provides stunning views of the coast and sea. The 11-Century Villa is now an upscale hotel, whose previous guests have included such notables as Virginia Woolf, Winston Churchill, and Salvador Dali. Up in the mountains and hills above the coast are little villages clutching the mountainside, where you’ll find some B&Bs much less expensive than the hotels in the main towns. The villages are quite small, nothing more than a hamlet with a little church surrounded by houses tucked in tightly together, with little lanes running here and there. 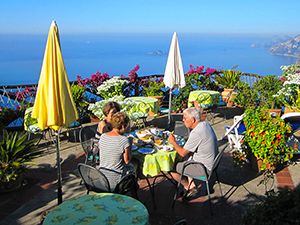 The views of the Costiera Amalfitana from the terraces here are often breathtakingly beautiful. Walk along the old coastal trails in these mountains and hills and you’ll be in an area unchanged in centuries, a terraced land of lemon trees and olive groves, with incredible views of the sea. These mountainsides are, in fact, sometimes destinations onto themselves. I stayed in one B&B in a village above Positano, taking the local bus down to town each day. There I met two couples that had been returning to the Amalfi for years to spend their vacation walking these hillside trails. Naples is the major transportation hub of the area. There you can rent a car or take a train to Sorrento or Salerno, the urban bookends of the Amalfi, where you can also rent a vehicle of continue your trip by bus. Traveling by one of the ferries that sail along the coast is another option. The best way to see the Amalfi, however, is by car, although searching for a parking space can be a competitive sport unless you’re staying at one of the more upscale hotels. Sometimes it makes sense just to park the car and take public transportation, which is very well developed here. Due to the serpentine nature of coastal road SS 163, the Amalfi Drive, driving can be a hair-raising experience although, thankfully, accidents are few and far between. Visit during the summer high season, and you’ll often find tour buses clogging the narrow highway, although the ride is exceptionally worthwhile, nevertheless. The best time to visit is in May or in September and October, months when the crowds have diminished and the weather is still beautiful. Absolutely a magical place. Went to Ravello several times as a child and made it to Positano last summer.